Nature wall murals are a proposal for all those who love home accessories inspired by the world of nature. Wall decorations will create a spectacular setting for your room decorated using natural materials such as wood, linen and wicker. Wall murals with a nature motif bring harmony and positive energy into an interior – they suit perfectly both classic décor and modern furnishings. In our collection, you will find picturesque landscapes depicting the most stunning places on earth – you can successfully integrate views from the most distant corners of the world or beautiful landscapes of mountains into your interior. A nature mural will liven up the room and give the wall an inspiring look. Nature inspired wall murals look beautiful combined with wooden elements – chests of drawers, glass-front cabinets and a coffee table, as well as classic upholstered furniture in earthy colors. A colorful fabric combined with photographic detail of forest or mountain landscapes creates an intriguing contrast; and paired with a charming meadow landscape, it highlights colorful and floral motifs in the interior design. In our collection, you will find 3D nature murals with a variety of motifs, including wall decorations featuring trees, rocks, water and a picturesque valley. Thanks to this, you can easily find a view that suits the color scheme and style of your living room. Nature inspired wall murals featuring natural wonders will fill you with positive energy and help you relax after a long day. Wall details can be used in a classic bedroom featuring accessories inspired by nature – the images will become a wonderful setting for floral accents and wicker accessories. Wall murals can also be successfully integrated into a bathroom decorated using natural materials such as stone and wood. 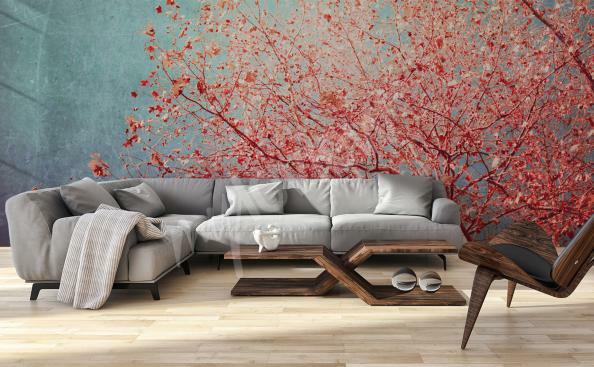 A nature mural works perfectly in rooms arranged in a modern style. A stunning landscape with mountain peaks will be a beautiful setting for light-colored, modern upholstered furniture and glass accents. To decorate your living room, you can use a wall mural featuring a waterfall or a lovely forest path. For a space decorated in a brown color scheme, we recommend using photographic decorations featuring a field landscape or images of a wild beach – they perfectly set off the natural color scheme. Nature wall murals will liven up minimalist interiors and add character to arrangements inspired by natural forms. Among the various designs you will find bold and colorful wall decorations made using state-of-the-art 3D technology. 3D nature murals create a contrast in interiors with light color schemes by adding a burst of colors, and in colorful rooms they set off colorful accessories. Zen nature murals create a beautiful setting for an atmospheric space, decorated in a light color scheme – white and pastels – with sophisticated accessories such as glass candlesticks, dried flowers and openwork details. A romantic bedroom lends itself to wall decorations featuring an atmospheric sunset by the sea. If the decor is dominated by floral patterns, a nature inspired wall mural with a flower-dotted meadow emphasizes the beauty of various types of patterned details and adds charm, finesse and joy to the room. A landscape with a romantic bridge against the backdrop of a lake will introduce a romantic, nostalgic atmosphere and an aura of mystery into the space. In order to decorate your interior, you can use murals featuring still life – these colorful compositions will add interest to your living room or dining room. Among the many different photographs you will find colorful fruit and dignified flowers. Bouquets in vases on wallpaper will constitute a graceful and subtle decoration for the table and chairs in the kitchen space – using a wall accent you can give your kitchen a beautiful look and colorful, eye-catching setting.